Welcome to the March edition of Blogger C.L.U.E. Society. Each month, the members pair up around a central theme. March’s theme just happens to be “Happy Easter” and my assignment just happened to be Rebekah from Making Miracles. Rebekah is a remarkable person with remarkable recipes. A quick “Easter” search on her site uncovered some great sounding recipes like Brown Sugar and Balsamic Glazed Pork, Jill’s Pork Tenderloin (wrapped in bacon, no less), and Pink Lemon Pound Cake. All of these sounded perfect for an Easter dinner. Then, I thought on searching for something made with carrots and voila! I found the perfect recipe for this month’s theme: Surprise Inside Carrot Bundt Cake. 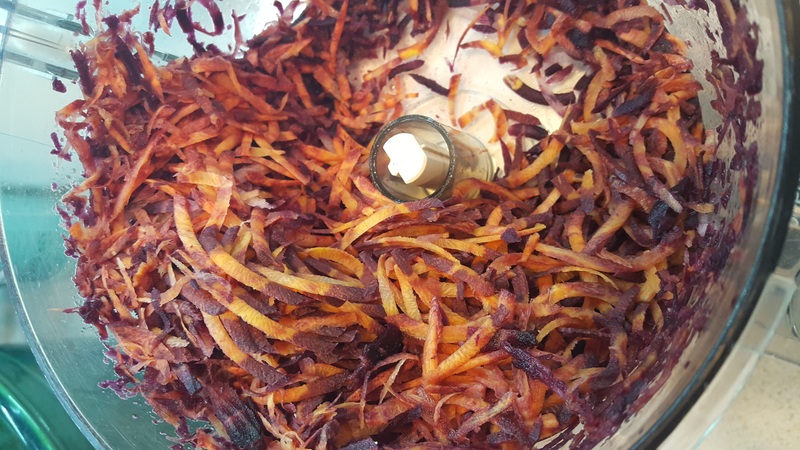 Not only was the main ingredient carrots, but it also had a surprise inside, just like those ubiquitous plastic Easter eggs. Preheat oven to 350 F. Grease and flour a bundt pan and set aside. Make the filling. Combine cream cheese, sugar and egg, mixing until well blended. Set aside. Make batter. In a large bowl, whisk together dry ingredients. In a smaller bowl, whisk together coconut oil and eggs. Add oil/eggs mixture to dry ingredients, mixing just until moistened. 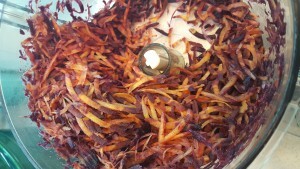 How do you like the color of these shredded carrots? Fold in carrots and nuts. Reserve 2 cups of batter and pour remaining batter into prepared bundt pan. Spoon cream cheese filling over batter. Carefully spoon reserved batter over cream cheese mixture, spreading to cover. Bake in preheated oven for 55 minutes or until wooden pick inserted in center comes out clean. Cool 10 minutes; remove from pan carefully onto cooling rack. Cool completely and then sprinkle with powdered sugar, if desired. I slightly adapted Rebekah’s recipe by using coconut oil instead of vegetable oil and 1/3 less fat cream cheese. I also used some still quite good but gnarly purple carrots from our late October harvest. Very gnarly but perfectly good Purple Haze carrots from our October harvest. 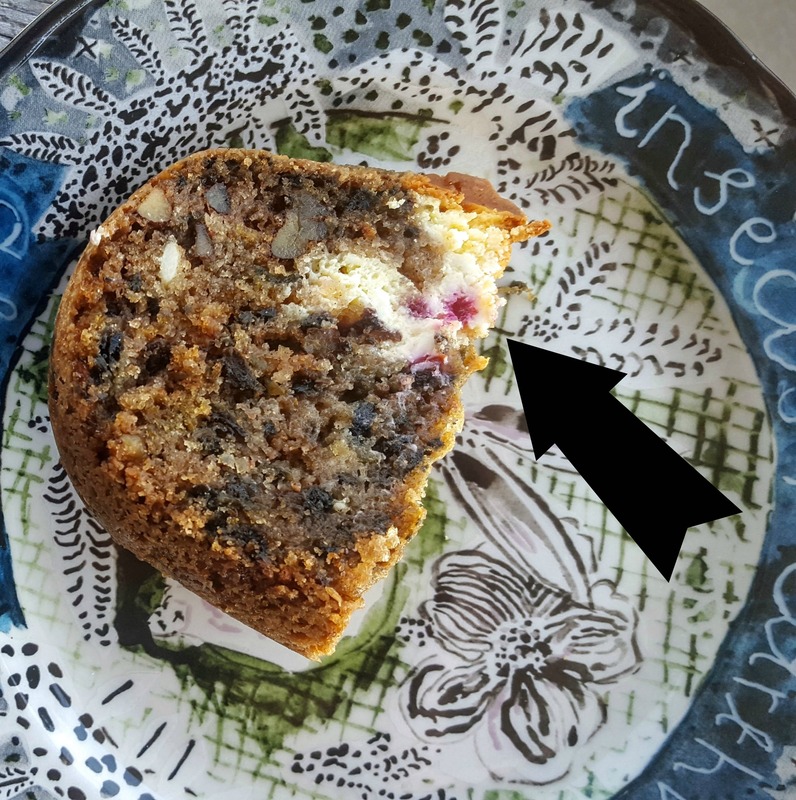 They were still resting comfortably in my veggie drawer and they gave the cake nice and Easter-like specks of purple. Rebekah, thanks for a great carrot cake recipe. My sister and I have a unspoken carrot cake challenge so I will have to make this for her the next time she visits. Please check out the other Blogger CLUE members and see what Easter dishes inspired them. Carrot cake is one of my very favorite desserts! I will definitely add this to my baking list—I could seriously eat a slice for breakfast!!! This is a super most and dense cake. I need to sneak in the kitchen and see if there is any left! Those colourful carrots make this cake really unique and delicious! Sorry ’bout that, Lea Ann. This is certainly crave worthy. Really, really, really, great recipe, Rebekah! So glad I found it! Thank you so much! I haven’t made carrot cake in a very long time. Thank you for the reminder that this cake is perfect for an Easter celebration! I hadn’t either. I will probably make this again before Easter. Carrot cake is so good! Never had one with purple carrots — what a surprise! 🙂 This is SUCH a good recipe — thanks. I was sooooo glad I found this recipe on Rebekah’s site. I adore Carrot Cake in any way, shape or form. However, I know for sure I have never seen or tasted one filled with surprises like yours. This Carrot Cake would make such a delicious conversation at any breakfast including Easter! I love the idea of carrot cake for breakfast! 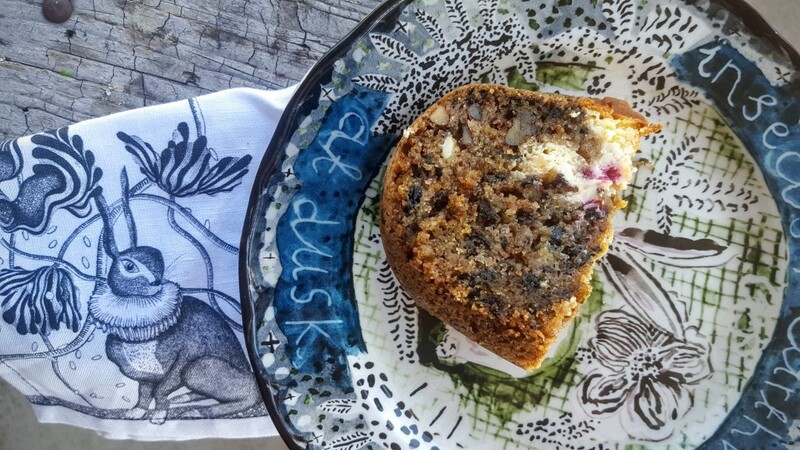 This sounds wonderful like an inside out carrot cake….LOVE it. Thank you. There’s not much left. It went pretty quick. I love carrot cake! This one looks just perfect and I love that you had a few purple carrots in there! Thanks, Amy. I had almost forgotten about these carrots. This was a great recipe to use some of them. I have a few of those carrots still in my fridge! 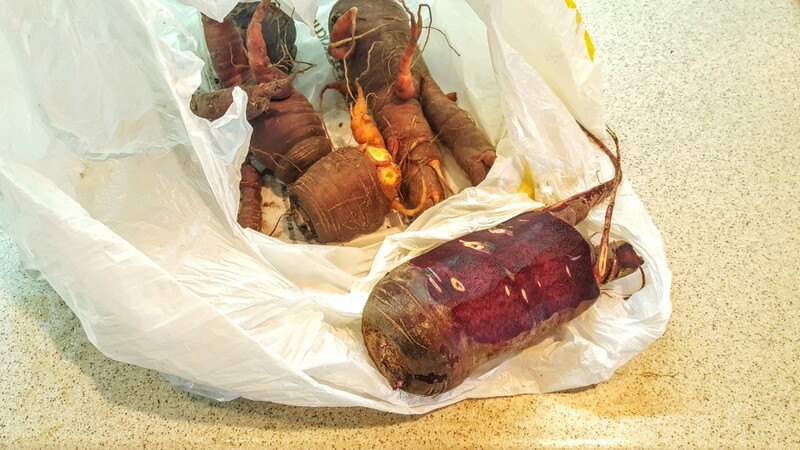 Don’t you love those purple carrots…they are so naturally sweet. Your cake is a perfect pick for Easter, however I could eat carrot cake just about everyday! I do love these carrots and there storing power. Wow, that cake looks so moist! I agree, you picked the perfect thing for Easter. I love the purple carrots as well. They add a confetti appearance to the cake. Maybe I could retitle this Confetti Carrot Cake. Carrot cake has been a favorite dessert of mine for years! Love the cream cheese surprise! Hopefully, I will get that surprise totally inside the next time I make this.